In space you still have to check your privilege. Today's guest review comes from writer, reviewer and all-around nerd Charles Payseur. His fiction has appeared, among other places, in Perihelion Science Fiction, Dragon's Roost Press, and is forthcoming at Fantasy Scroll Magazine. His fiction reviews have appeared in TeenReads and Kidsreads, GraphicNovelReporter and Tangent Online. Speculative fiction in general, and science fiction in particular, has a long history of examining injustice, in prompting deeper understand and a more complex view of the Other. In true Western fashion, though, the stories that get held up as shining examples of brilliant speculative fiction have been, and are still often from writers in the majority, white writers and male writers and straight writers and affluent writers, writing about (mostly) white and male and straight and affluent characters and problems. Much less prevalent have been voices from cultures directly marginalized by the mainstream through historical and cultural colonialism. And it is that lack that We See a Different Frontier seeks to address by specifically and consciously presenting a collection of stories from a post-colonial point of view, from cultures and peoples dealing with the aftereffects of war and conquering, of assimilation and appropriation, of erasure. It is an incredibly complicated collection to approach, because the stories are not expected, are not uniform or typical, but come from a space that most people don't like approaching because it is uncomfortable to do so as a person in the majority. Which makes me both an excellent and a terrible person to review this collection, because I am white and male and while not especially straight or the most affluent, I am most definitely Western. And I feel like because of that this collection represents something that is very important for me and for other Western readers to experience, because it confronts the reader with the effects of colonialism, both the brutality of war and the just-as-real suffering of cultural colonialism. It doesn't pull its punches, and it is not the happiest of collections, not the most fun to read. Not because the stories are less than amazing (they are great) but because they push at ideas that are left well alone in polite (affluent and white) society. The diversity of the stories, though, does an admirable job of showing the range of voices and experiences that have largely been ignored in the wake of the massive colonial efforts of recent history (the last five hundred years, mostly). Not to say that all of these stories are historical in nature (though some are). 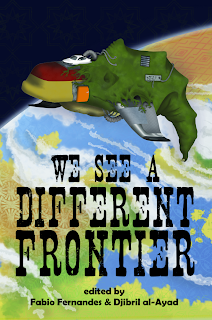 The colonizing ranges from past to future, from India to Mexico to other worlds. There are historical fantasies like Sofia Samatar's "I Stole the D.C.'s Eyeglass" and Gabriel Murray's "Forests of the Night." There is the hard science fiction of "The Gambiarra Method" by Fabio Fernandes and the softer, near-future science fiction of Silvia Moreno-Garcia's "Them Ships" and the cyberpunk stylings of "Vector" by Benjanun Sriduangkaew. Characters are old and young, male and female, straight and queer. And yet in the end the stories all share a cohesion that makes them powerful, that leads from one to the next and on, a parade of voices fighting back against the pressures of oppressor and colonizer. They are challenging, and they are deep, and they got me to think and to feel. My favorite stories in the collection were J.Y. Yang's "Old Domes" and Sunny Moraine's "A Heap of Broken Images," which are both haunting with a splash of hope, and like many of the stories confronted the ideas of identity and erasure, though in different ways. In Yang's piece, a young woman who exorcises the spirits of old buildings deals with a difficult assignment and learns a bit about history. In Moraine's, an alien tour guide begins to confront a past that his people are determined to ignore. It is somewhat difficult for me to find critical things to say about any of the stories, in part because any criticism that I could find is also subject to thought and introspection. It forces in ways that other stories or collections might not the reader to confront how preference can be shaped by culture. I will say simply that We See a Different Frontier is one of the best collections I have ever read. I felt each story was worth reading, and that as a whole the anthology provides a mosaic of experiences that is important to read for anyone interested in speculative fiction today. It is a game-changer, it's uncomfortable in all the best of ways and the stories are amazing. There is representation, there is voice, emotion, everything. Bonuses: +1 for the sheer range of genres, writers, and characters, +1 for addressing a part of the human experience often overlooked in speculative fiction. Negatives: -1 for not being a particularly happy read (be ready to feel uncomfortable at times). Reference: Fernandes, Fabio and Djibril al-Ayad, eds. We See a Different Frontier [The Future Fire, 2013].